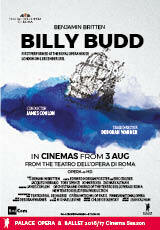 Opera di Roma: BILLY BUDD | Movies | Palace Cinemas | Share our passion. New Production! Based on the novel by Herman Melville, Benjamin Britten’s gripping contemporary opera was first performed at the Royal Opera House on 1951. Setting sail for the first time in Rome this season, this hugely acclaimed new staging by renowned British director Deborah Warner is a co-production with the Teatro Real of Madrid, the Opéra National de Paris and the Finnish National Opera. Conducted by American James Conlon, and featuring South African baritone Jacques Imbrailo as Billy, Britain's Toby Spence as Captain Vere and Canadian John Relyea as the villainous Claggart, this is a truly international collaboration and a thrilling experience. Captured live from Teatro Costanzi, Rome, 5 June 2018.